Like gold silver trading too benefited yesterday from both a weaker Dollar and a rally in copper. In addition silver trading prices were also boosted by bullish data from France and Germany suggesting that Europe’s two largest economies may be pulling out of the current recession/depression. As a result of this rosy optimism silver trading prices soared 53 cents higher to finish at $15.070 per ounce which from a technical perspective was highly significant as silver prices once again breached the $15.00 per ounce level. Technically yesterday’s candle on the silver trading chart ended the session as a wide spread up bar with no wicks and therefore suggesting further bullish momentum in the short term. 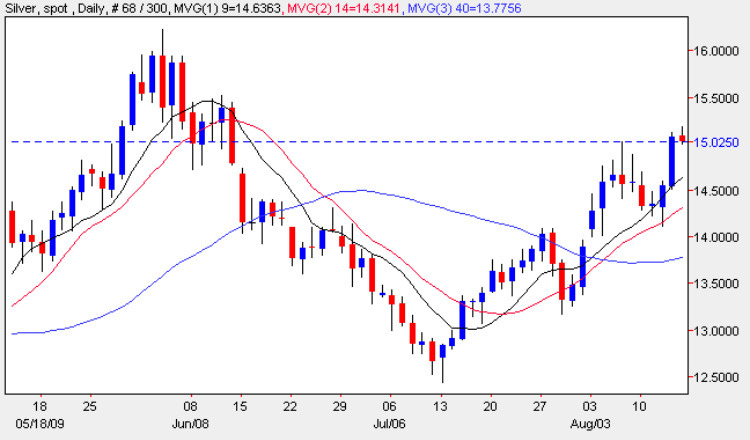 With all three moving averages now pointing higher the only concern remains the resistance between $15.00 and $15.50 and should this be breached during silver trading today or Monday then we should see an attack on the $16.00 per ounce level once again. With the weekend ahead and with relatively thin volumes in silver futures, we may see an element of profit taking today as traders square their positions, so any trading today must be approached with a degree of caution.